"Bob? Daddy and I got you a surprise." "You're going to Jedi Camp! You're going to learn to be a Jedi." "You mean like the one where Anakin went and had to leave his mom forever and ever?" "Oh, no, Baby. It's just at the park for a few hours a day for a week in June. I'll be there with you the whole time." "Oh, okay. That sounds even better than the other way." SERIOUSLY?! There is such a thing? What do they learn? Man where do you live? Neverneverland? A Jedi camp! What a childhood Bob has. Amazing mother you are. Adorable Bob is. Is it too late for me to go to Musical Comedy Camp? So this means you'll both be Jedi's? Mama Jedi and Bob Rosenberg Jedi? I think Bob might need therapy. Oh my heart. 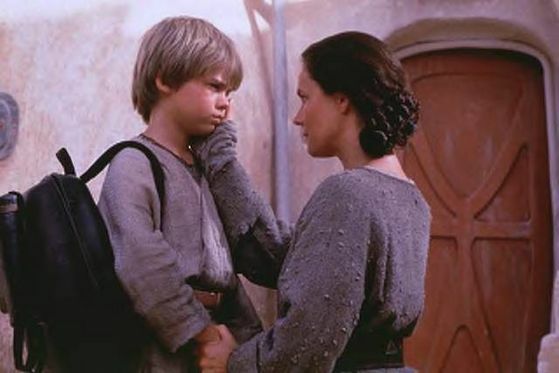 The ONLY part of the entire Star Wars series that bothers my 6yo is that scene where little Ani leaves his mother. What a sweet boy you are, Bob.